This Halloween weekend, there’s a certain story I keep thinking about. It involves a group of young troublemakers, a college town, and damage to property. Sure, this describes almost any Halloween in the history of Madison, Wisconsin’s existence. But in this case, the college town is Bloomington, Indiana. It’s about 1920, and several unlucky residents find themselves faced with a messy problem: Their outhouses have been toppled to their sides. They didn’t know it, but this dirty deed had been done at the hands of some troublemakers who went by nicknames like “Wad” and “Monk.” Among them was their ringleader, one “Hogwash McGorkle,” known now to most as Hoagy Carmichael. If you recognize the name at all, you probably associate it with songs like Stardust, Georgia On My Mind, A Nightingale Sang In Berkley Square, and so many others. Or you might be familiar with his, um, unique singing voice. I personally made the mistake of assuming that because Hoagy Carmichael wrote hundreds of recognizable tunes, he must’ve been a reclusive workaholic– a true bore in real life. I figured the charm of his catchy lyrics and the captivating stories told in song were a product of his skills as a wordsmith rather than a reflection of his own personality and experiences. But when I recently discovered a copy of Hoagy Carmichael’s autobiography, The Stardust Road , at my favorite locally-owned used bookstore , I quickly scooped it up and got to know the man behind so many of my favorite songs. It turns out flipping outhouses was just the tip of the iceberg when it came to Hoagy’s hijinks, and he wasn’t afraid to admit it! Hoagy Carmichael grew up in Bloomington, Indiana. His family didn’t have much, but they had a piano, and it was just about all they needed. While many families gathered around the dinner table, the Carmichael clan most often found themselves coming together around their 88-key upright. His mother — “eighty pounds of solid rock” and the only person to call him by his full name, Hoagland — was the town’s piano player accompanying the silent picture shows at the local theater. Playing ragtime music was her gift. He loved Bloomington. It might’ve been his lifelong home, if not for the fame he achieved later in his life (he eventually moved to L.A.), and for a bit of trouble he got himself into at the age of 15. That’s when he was kicked out of high school, “for something [he] said to a girl in braids.” Sadly, he never tells us exactly what it was that he said. The family then relocated to Indianapolis where he attended, and later dropped out of, another high school. In 1919, he returned to Bloomington to live with his grandparents and re-enroll in high school. By then, he was much older than the rest of his classmates. 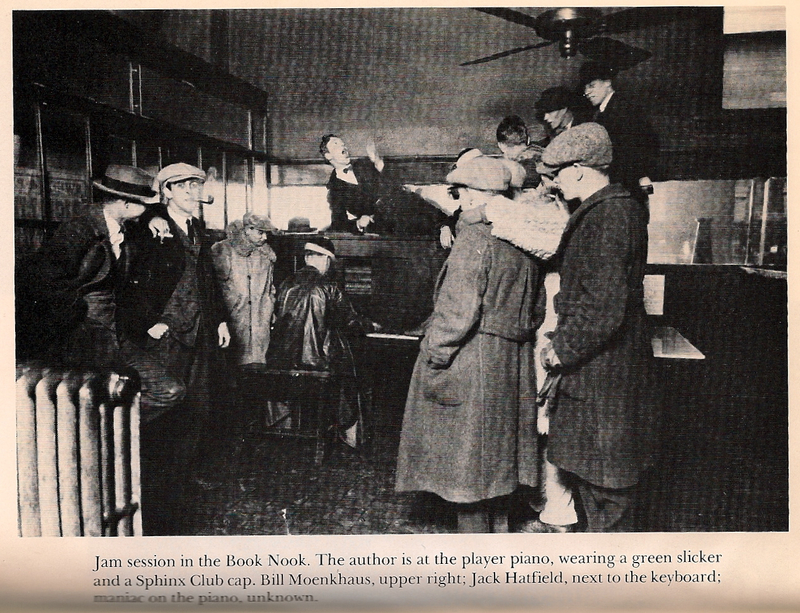 Before too long, Hoagy was attending Indiana University, where he met Bill Moenkhaus (“Monk”) and Wad Allen (“Wad”), who’d quickly become his best friends and partners in crime, literally and figuratively. All were musicians, and they did their best to sustain themselves financially by playing at frat parties and sorority houses as a group called Carmichael’s Syringe Orchestra (oh to have been at frat parties before the invention of hip-hop!). They found respite at a local bookstore-cafe known as The Book Nook, where they found an old piano in the corner, improvised songs, and shared their mutual passion for “hot jazz” with a less-than-appreciative clientele. One day, as Hoagy stewed over the stress of midterms and the threat of a diminishing GPA, he stopped by the Book Nook and started to pound his frustrations out in a mish-mash of chords on the piano until he found a theme that stuck with him. He worked on this refrain for hours — missing class entirely — until he’d written a new song altogether: The Washboard Blues. Hoagy’s college years, and those soon thereafter, took place during Prohibition. But tell a frat boy he can’t have alcohol and you’re only asking for trouble. In fact, some of Hoagy’s most entertaining stories revolve around bootlegging. The spry, 100-pound Carmichael had a way of weaseling his way out of trouble. But he wasn’t always lucky. One night in the spring of 1925, he visited a woman he called Granny Campbell, who secretly brewed her own (allegedly potent) beer. That night, after weaving their way home by car, Hoagy and his friends were stopped by the police, arrested, and tossed into jail until a friend could bail them out the next day. ‘fore I tan your hide. A couple years later, Hoagy happened to be enjoying another illegal bottle of beer with vocalist Al Rinker and his sister, Mildred Bailey, who sang the song for them. Paul Whiteman eventually had her record it, and it became the theme song of her career. As the years rolled by, jazz lost its popularity. Hoagy found the likes of Rudy Vallee and Guy Lombardo dominating the radio airwaves, and unfortunately people preferred listening to music on the radio to buying jazz records. As Hoagy tells it, you’d think the story ends here and that his career fizzled out with only a handful of popular hits of which to speak. You’d also think that after a series of heartbreaks, Hoagy went off and died a lonely old man. But Wad’s letter informs us that Hoagy eventually found happiness when he married a woman named Ruth. George Gershwin attended their wedding reception, sidled up to a piano, and debuted the leading songs from the yet-unpublished musical we now know as Porgy & Bess. Hoagy and Ruth had two sons: Hoagy Bix (named in part after Bix Beiderbecke, whom Hoagy admired immensely) and Randy Bob. All in all, The Stardust Road reads more like a diary than the typical autobiography usually would. Hoagy relays his story with the same nostalgic sensibility that’s reflected in his music. His writing is probably the most captivating when he tells of the ladies who entered (and later exited) his life. In describing his courtships, he illustrates how he’d improvise a tune on the piano and dedicate it to the girl sitting next to him to win her heart. He’d carve their initials into the tree at a nearby park. The book doesn’t appear to have gone through much of an editing process; there are typos and misspellings throughout. Furthermore, Hoagy’s son, Hoagy Bix, indicates in the foreword that published copies of his father’s story sat on a bookshelf mostly untouched (save for a few that were handed to friends/family) for several decades before the publisher encouraged Hoagy, Jr. to allow the book to be re-released. Most of us measure the years in days, weeks, or months. Hoagy saw it this way: “The years have pants.” His songs have withstood the test of time — surviving the days of pinstripes, tweeds, and bellbottoms. Now they cling to the tattered jeans hanging halfway off your bum today. But despite his music’s legacy, Hoagy himself has mostly been forgotten, overshadowed by the likes of the Gershwin brothers, Cole Porter, Irving Berlin, and others. We know his music. We love his music. Let us not forget the scrawny, softhearted, troublemaking musical genius behind it.